Las Vegas, December 30 – Insta360 Nano, the world’s most popular clip-on 360 camera for iPhones, is the first 360 camera natively integrated with Periscope to support live 360 video. 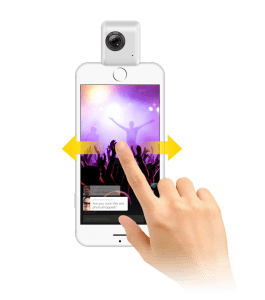 The new feature will enable anyone with a Insta360 camera to livestream 360-degree videos of live events, travel adventures, parties, gigs, festivals, or sports activities straight to Twitter and Periscope. While everyone on Twitter and Periscope can watch live 360 videos, currently only selected partners can go live in 360 via Periscope. Twitter will be rolling out this feature more broadly during the coming weeks. Watch Periscope broadcaster Alex Pettitt using the Insta360 Nano to livestream 360 video on Twitter for the very first time here. The Insta360 Nano is available from retailers worldwide with a suggested price of USD$199, making it the most powerful yet affordable VR camera on the market. The Insta360 booth will also display and demo the Insta360 Nano which won the prestigious CES Innovation Honoree Award in the Virtual Reality category. The Android version of the Insta360 Nano, the Insta360 Air will also be on display. Insta360’s booth at CES 2017 is 26608 in South Hall 2 LVCC in the Gaming & Virtual Reality Marketplace. Insta360 will also be holding a press event at LVCC, South Hall Connector, Room S228 – CES Las Vegas 2017 on January 5 at 3pm PT for another exciting, special announcement boasting 360 in 8K. There will be live demonstrations and opportunities to get hands-on experience with all of the latest products and to speak directly with the Insta360 team. Established in 2014, Shenzhen Arashi Vision Co. Ltd is a consumer technology company committed to creating the world’s most advanced and affordable 360-degree cameras. Designed to be lightweight and portable, the products can be used in tourism, real estate, mass media, events and conferences, among other industries. With a vested interest in virtual reality, users can view the content created by the cameras in VR headsets for a truly immersive experience. I purchased a Nano with the intention of buying more for my grandkids. Is there a way to watch the videos and photos on an iPad or Windows PC? I would like to share with friends without using Social Media. Thank you. Could you help me get access to publish 360 live content via my new insta360 nano? I am already approved as a periscope producer broadcaster for 360. Hi There! We are searching for some people that are interested in from working their home on a part-time basis. If you want to earn $100 a day, and you don’t mind writing some short opinions up, this might be perfect opportunity for you! Simply click the link here NOW! viral easily, you need some initial traffic only. There is a sneaky method to get massive traffic from social media. I lost the recognition barcode before i scan it for installing the application. What can i do? Where is the one click live for Youtube and Periscope?